There are several possible causes of facet joint pain, but all revolve around the concept of dysfunction of the spinal zygapophyseal joints or compression of neurological tissue due to changes in the facet structures. While it is not crucial for patients to know exactly what causes facet joint pain once it exists, this resource section is invaluable for people who are trying to prevent themselves from suffering facet joint symptoms later in life, care providers who want to increase their knowledge of facet syndrome and patients who feel that they might have been misdiagnosed with the verdict of facet pain. This background resource section provides a comprehensive overview of the most commonly cited reasons for facet joint pain to occur. We will also debunk many of the myths of facet syndrome by providing objective analysis of why many of the causative factors of structural change in the joints might be misidentified as being contributory to the symptomatic expression. If you are interested in learning the origins of facet joint syndrome, then this resource section will provide all the information you will ever need. It must be noted that facet joint degeneration is completely normal, while painful facet joints are the exceptions to the rule. Most degeneration does not cause mechanical dysfunction or neurological compression, so no pain is experienced. Pain will only occur when a pathological form of facet joint change occurs, such as in the case of verified facet joint syndrome. Mechanical pain syndromes describe scenarios where the joint can not move properly, usually due to the growth of osteophytes on the skeletal surfaces of the joint. Some mechanical pain syndromes are caused by the organic fusion of facet joints due to disease or dramatic deterioration. Finally, soft tissue conditions can create overly tight or lax facet joints that are also considered mechanical defects. Symptoms from mechanical dysfunction range greatly in severity, but should be experienced locally and be inherently linked to joint movement. Facet syndrome might also involve neurological pain from small nerves that become compressed within the joint structure, once again virtually always caused by the osteoarthritic processes and deterioration of the joint structure. When this is the diagnostic theory, pain should be extremely localized and not overly severe. Additionally, pain will almost always be linked to specific movement of the affected joint. Finally, although not classified as facet syndrome, bone spurs can grow off the facet joints and block the neuroforaminal openings, potentially compressing the exiting nerve root. This is s classic compressive neuropathy and should be managed like any other verified pinched nerve diagnosis. Symptoms can be far-ranging and will likely progress as per the clinical expectations from pain and tingling to numbness and weakness in the innervated region of the anatomy. 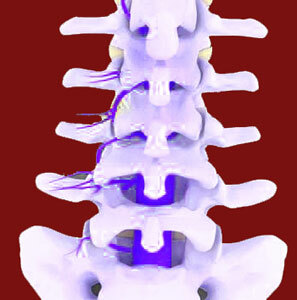 Facet joint injury can result from trauma to the spinal column. Typically injury affects the vertebral bones through fracture or dislocation. Facet joint fracture is usually painful, but will not necessarily result in persistent pain that truly qualifies as facet syndrome. Facet joint dislocation also rarely causes chronic pain once the joint is corrected in its functional alignment. Mechanical facet joint pain describes symptoms that result from interactions within the joint during mobilization of the affected vertebral level. In essence, when the 2 vertebrae move against one another, the surfaces interact in a painful and sometimes damaging manner. Facet joint instability can result from injury, surgery or extreme deterioration related to age and activity. Unstable joints may or may not be painful, but may cause other problems even if not directly symptomatic. Obesity facet joint pain is commonly reported, since extra body weight places great stress on the spinal joints and exacerbates both degeneration and the potential for injury. Facet joint pain and posture might have origins that are related. Postural issues can change spinal structure over many years and may even become the primary symptomatic source of many different dorsalgia syndromes. Hypermobile facet joints move excessively and might become unstable. Hypermobility is usually not painful, but might become symptomatic in some patients. Hypomobile facet joints do not demonstrate normal ranges of motion. Hypomobility can be minor or extreme, with the worst examples actually fusing the joint into a solid and unmovable mass of bone that will definitely have negative consequences on spinal functionality. Facet syndrome from surgery is one of the more common causations of apophyseal joint symptoms. Surgical interventions are known to cause direct injury to many spinal structures, as well as set the tone for accelerated and advanced deterioration of the spinal tissues. Ankylosing spondylitis of the facet joints can fuse the structures or create dysfunction through mechanical interactions. Similarly, rheumatoid arthritis of the facet joints can be very painful and might result in severe restrictions of typical joint range of motion. Degenerative disc disease and facet disease are related by both their ridiculous names and their slim possibility for pathological consequences. Get a detailed view of the various contributing factors to facet syndrome in our exposé titled: What causes facet joint pain? True facet joint pain really only has 2 underlying causation mechanisms that might express themselves in various manners: First, skeletal changes to the joint itself can create mechanical or neurological pain when bone spurs impinge on tiny localized nerves or prevent typical joint movement. Second, changes to the soft tissues might create pain through joint laxity or tension problems. All facet joint-related pain syndromes fit into one of these two possible models of causation. For additional information on the effects of facet joint structural changes, please enjoy our comprehensive view of facet joint symptoms for a complete accounting of all possible clinical expressions. Now that you have a better idea of the causes of facet joint pain, you can work towards a cure. We recommend our proprietary pain relief program as the best approach and many notable doctors and healthcare organizations agree.